If you’re an adventurous spirit who is looking for the ideal coastal paradise, you’ve found it in Goleta. Find the best spots, trails, and outdoor activities with our Outdoor Adventure itinerary. Take a deep breath of fresh ocean air, spot a butterfly, go for a surf, or simply unwind at the beach! Start with a ride. You can bring your own bike, or rent one from a variety of local bike shops. To call out a single ride would be unfair as there are so many that wind through the nearby hills and along the coast, so when you’re renting your gear, make sure to ask for some advice on a trail and distance that suit your needs. One of our favorite loops is the Goleta “Obern Trail” Bike Path. 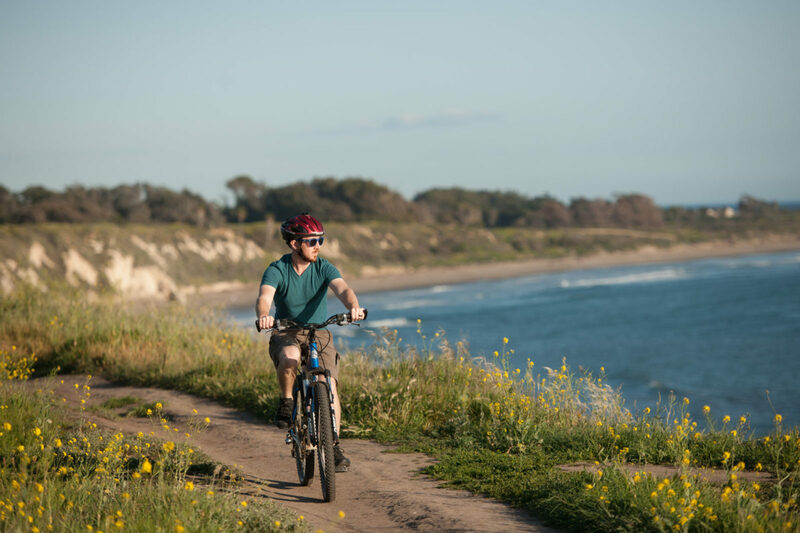 This flat, paved path provides a completely do-able 21-mile loop that gives you an excellent glimpse into many of Goleta’s treasures. It winds through UCSB’s campus, lemon groves, and even past some old Chumash Indian villages before routing back to Goleta Beach. Opt to do all 21 miles, or simply go for a casual spin, stopping for some time in the sand or a great bite to eat along the way. Follow your ride with a hike to the Gaviota Wind Caves in Gaviota State Park. These unique sandstone formations draw the eye, and the hiker, inland for a beautiful trek among the Santa Ynez Mountains. Easily accessed from Highway 101, this hike to the geological eye candy is 2.5 miles round-trip and includes 600 fee of elevation gain. If you hit the trail during a rainy spring, you’re bound to see some wildflowers and green hills peppered with the orange sandstone formations that define this adventure. As we so often say here in Goleta, make sure to bring your camera! This trek is a particularly photogenic one. After your hike (or possibly as a start to another day), rent a standup paddleboard from Paddle Sports Equipment Rentals. You have a variety of local beaches to choose from, but consider Goleta Beach for a big bay and accompanying trail system. If you’re a surfer, you will want to add Campus Point to your day’s agenda. Located near UCSB, this well-known break is a favorite for surfers and boogie boarders alike. It also works well for family members and friends who don’t surf but like to watch. Tide pools are stock full of starfish and other friendly sea life. After a dip at Campus Point, consider heading to dry ground for some disc golf. Evergreen Park is located in Goleta and features an 18-hole disc golf course. The course is par 54 and approximately 4500 feet long. Your adventures can continue to take flight in an entirely unique way with a visit to the Goleta Butterfly Grove. From mid-November through mid-February, hundreds upon hundreds of Monarch butterflies stop off in Goleta. Docents are available on weekends from 11:00 a.m. – 2:00 p.m., and the Grove is open for viewing every day during daylight hours, free of charge. This peaceful and beautiful spot is adjacent to 137 acres of natural terrain, which includes designated trails and beach access. Outdoor lovers young and old will be talking about this experience for years to come! The small wildlife watching can continue at Lake Los Carneros. Enjoy the walking trail for a peaceful stroll along the banks of this tucked-away lake. Kiddos will want to listen and keep an eye out for croaking frogs and birds both in the water and along the lake’s shores.